The news broke this morning: another school shooting, this time in Santa Fe, Texas. I don’t want to think about it. I don’t want to entertain the thought that this most recent massacre is the 22nd school shooting this year. I can’t bear to think that ten more families will be planning funerals and that lawmakers will do nothing but send thoughts and prayers. I fear that we will all go to school on Monday wondering if what happened in Texas and in Parkland, Florida could happen in our own school. What will be my intellectual distraction? The royal wedding between Prince Harry and Meghan Markle is taking place tomorrow on Saturday, May 19, 2018. When I see news reports of their upcoming nuptials, I get all choked up. But why? After learning more about “Suits” actress and soon-to-be Princess Meghan Markle, it became apparent to me that America may be on the precipice of a teaching moment where our history, culture, and future will all blend into a fairy tale story early Saturday morning in St. George’s Chapel in Windsor Castle, England. You don’t have to be a royal watcher to recognize that the United States and the United Kingdom have a longstanding “special relationship” that stretches back to the late 1800s in the years preceding World War I. After two world wars and mutual support during the Cold War, America and the UK have shared democratic values as well as our common heritage. Both nations are also undergoing cultural change, where racial and religious minority groups are claiming a stronger voice in the national consciousness of their respective nations. Both nations are also seeing the rise of populist political movements that tend to stress the Anglo-Saxon roots of both nations while excluding groups of color and immigrants. The election of Donald Trump in the United States and the referendum to exit the European Union, known as “Brexit,” reflect a nativist resurgence that has emboldened conservative and reactionary elements while alarming liberal and progressive constituencies in both countries. It is amidst this backdrop that Prince Harry has asked the Royal Family to embrace an American woman of biracial heritage. From our view “across the pond,” we will watch with both adulation and anticipation to see how “Merry ol’ England” will receive Ms. Markle as she becomes the latest addition to the British monarchy. The United Kingdom continues to love and support its Royal Family, though Princes William and Harry have grown up in the shadow of their late mother, Diana Spencer, who remained the Princess of Wales when she divorced Prince Charles. She died tragically in a car accident in Paris in 1997 when the boys were just 15 and 12 respectively. Diana had become an advocate for the dispossessed through her work fighting AIDS in Africa, leprosy awareness, and the removal of landmines in Cambodia and other war-torn regions. She fundamentally altered the role of the British Monarchy, pushing people who were born into privilege to become activists for the betterment of mankind. In 2013, the Duke and Duchess of Cambridge, better known as Prince William and Kate Middleton, took over the legal ownership of her memorial fund, and the couple and Prince Harry have become activists in their own right to use their titles to improve the human condition. Prince Harry has become well-known for supporting the status of British veterans who served in Iraq and Afghanistan. As Ms. Markle becomes a member of the Royal Family, she will bring her experiences as an American woman of color into the history of tradition and protocol of the British Monarchy. She has emerged as a strong advocate for women’s rights and feminist principles in her off-screen activities, speeches, and writings. Her biracial background has made her empathetic to the plight of the disenfranchised and the “other” in a predominantly white society. In the tradition of Prince Harry’s mother, she has also taken on the fight for HIV-AIDS awareness. They have both announced upcoming events in this field, and she will join the royal children as executors of Princess Diana’s foundation. American democracy has evolved out of the British monarchy as a political system. We pride ourselves as a democratic republic as we pledge every day to our nation’s flag, “and to the Republic for which it stands.” But we can learn much as a nation from the heroes of the British monarchy. Princess Diana, like Martin Luther King, John and Robert Kennedy, and Mahatma Gandhi, died too soon to fulfill their mission to mankind fully. 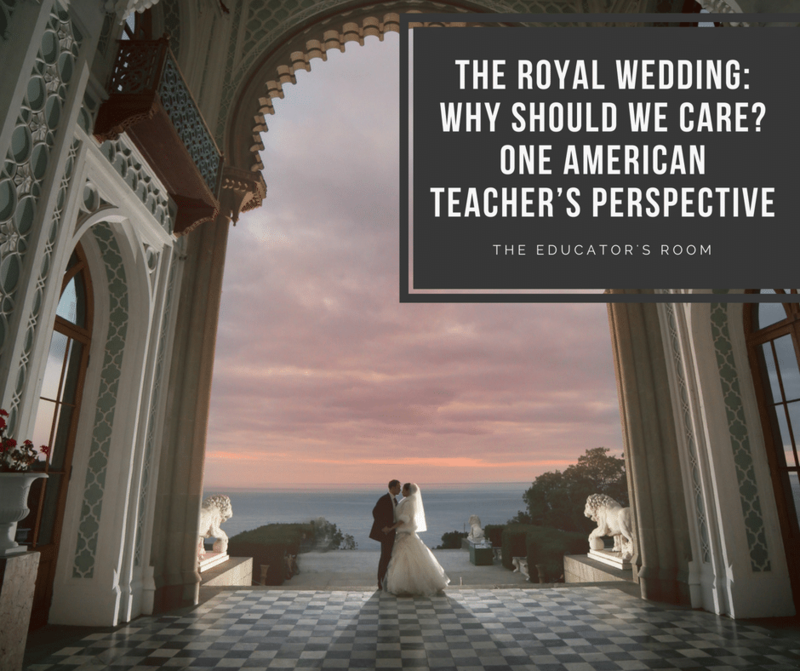 As teachers, we can place the generation of Royal Family that waits in the wings to take the soft power that comes with their titles in the spotlight through our lesson plans. Social studies teachers can work the Royals into their study of government, society, and history. Language Arts teachers can use the love story of Meghan and Harry and his struggle to become more than Prince William’s brother (known in England as “the heir and the spare”) to bring the Royals down to earth and allow students to relate to them as humans rather than historical figures or celebrities. English teachers can draw from the royal experience as the basis for their readings, stories, and creative writing. Teachers of French, Spanish, German, and Latin can integrate the history of the royal family to help their students practice and employ their newly acquired language skills while exploring British culture and tradition. The curriculum is brought alive through the stories of these individuals, who in spite of their glamor, wealth, and privilege, are still just human beings. When we recognize our common humanity, we can learn from them, and in the circle of our own lives, emulate the beauty and kindness that they have demonstrated in their lives. Saturday’s news broadcast will be a contrast of the sacred and the profane, the violence of our own nation presented next to the joy of the world’s most famous newlyweds. After the celebration, we must all get back to work figuring out how to end the violence and increase the peace on this side of the Atlantic.